Thorough, well-managed and easily accessible documentation is vital for the smooth running of any medical practice. At Images-On-Line we can provide a full range of document management services including everything from scanning existing documentation and storing it on cloud servers, to the secure shredding and disposal of paper copies. Would you like to learn more about what we can do for you? If you are responsible for the management of medical documentation, get in contact with us today. A member of our experienced team would be happy to talk through the services that we provide to help you understand what they can do for you. 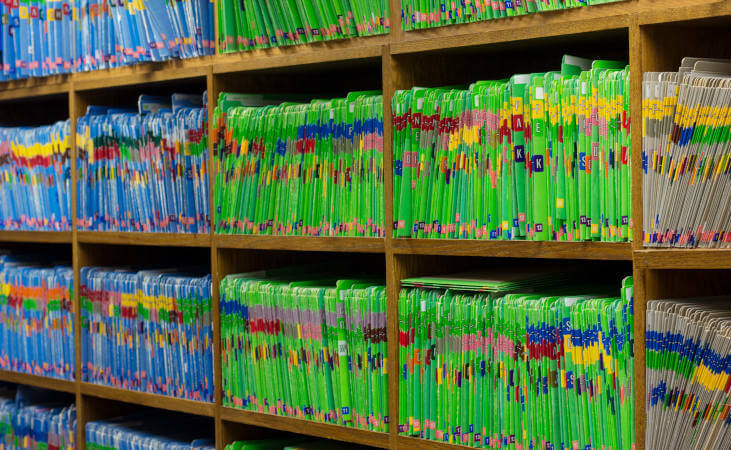 If you currently hold all of your medical records, patient details and other files in paper copies, it could become an issue. Not only does the amount of space required for storage become prohibitive over time, but having a huge archive of documentation can make it difficult to find important files quickly. This can become an operational issue. Images-On-Line can provide you with a comprehensive document scanning service in which we scan your existing paper documentation to make it suitable for digitisation. We can either carry out the scanning at your site or move the documents to our facility for processing – we are happy to work around your needs and requirements. In conjunction with GDPR 2018 we of course adhere to the caldicott principles as documented in the caldicott report on patient confidentiality 2003 together with awareness and compliance with (where appropriate) the ‘National Minimum Care Standards’. The proper disposal of documentation is an important task for medical practices. We can provide you with document shredding services that work within full compliance of the General Data Protection Regulation (GPDR). Once again, this service can come directly to your premises, or we can handle the work off-site. If you are interested in moving your documentation to a digital system, we can provide you with cloud storage. Our highly reliable storage options make it easy for you to access patient information and other data quickly. We offer a solution that is entirely tailored around the needs of your organisation. Can you work with confidential documents? We understand that many medical practices work with confidential and sensitive documents. We work in full accordance with the relevant rules and regulations, including the GDPR. We can work at your premises to keep all the files on site, or the documentation can be processed elsewhere, and you will be supplied with a certificate of compliance. Images-On-Line offers a full range of document management services across the whole of the UK. Get in touch with us for details.